Located in Southwest Ontario, between Toronto and Windsor, London has a population of around 370,000 and a metropolitan population of around 475,000 making it the 11th largest metro area in Canada. London is named after London England. It was named after the British City to attract immigrants from all parts of the British Empire to Canada. London sits in Middlesex County. London's nickname is the Forest City, because it was built right in the middle of dense forest, although it's difficult to tell that today considering the changes which London has gone through over the years. London is the home to Western University, formerly the University of Western Ontario or UWO and to Fanshawe College. It's also home to the London Health Sciences Centre which features Victoria Hospital, University Hospital and St. Joseph's Hospital. Car accident victims in and around the London area are treated at one of these hospitals for treatment following their personal injury accident claims. London is also home to one of Goldfinger Law's 3 main offices. The London office of Goldfinger Law is located at 341 Talbot Street, near the corner of Talbot and King in the heart of downtown London. 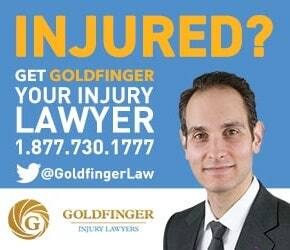 Goldfinger Law's London office is steps away from the Courthouse, the John Labatt Centre and the Convent Garden Market. Our London offices services our clients in the London area, and the rest of Southwestern Ontario. Three quarters of London's population practices or associates themselves with Christianity. The next largest religious group are Muslims who make up 4% of London's population. Labatt Brewery and Carling Brewery were founded in London. Great West Life and London Life also call London Ontario home. But London has fallen on tough economic times as of late. Electro Motive Diesel which used to employ around 475 Londoners was bought out by Caterpillar Equipment. Caterpillar and Electro Motive Diesel's Union were involved in a heated labour dispute. The end result was that Caterpillar is closing down London's Electro Motive Diesel plant and moving operations to Muncie Indiana. When the announcement was made, it was a sad day for Londoners and Goldfinger Law. We were and remain a proud supporter of those Electro Motive Diesel workers who lost their jobs and careers on account of this labour issue.